This Thread is closed now. The cars in the pack should all have the same base model: Pemto. Please stick to the original Pemto mapping. Every car need a different starting number - please choose one (00-99), I will list the used ones below. The starting number must have 2 digits. For numbers below 10, please put a zero in front of it. Every car should have a sponsor. This sponsor should be no real brand, but it can be based on a real brand. 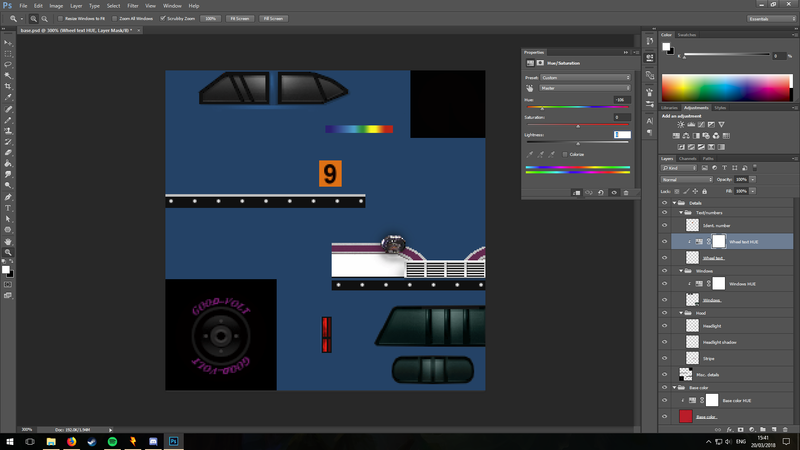 The liveries must have 256x256px. If it's bigger, we will scale them down before using for the pack. Every car must have the same "basis parts" (same front grill, same back lights, and so on). Small adjustments are allowed. Please stick to the standard wheel design (especially the rim, but also the tire color). However, you are allowed to change the color of the text on the tire ("Good-Volt"), or completly replace the text to a different one. The starting number should be on the sides and on the top of the car, and have the same size as Pemto‘s. The hood is free for whatever you like. You can place the starting number on it, or a big sponsor logo, or both. Last edited by Kiwi on Thu Apr 19, 2018 11:24 am, edited 328 times in total. How faithful to the style of the existing Pemto cars should ours be? I get that colors/sponsors are a thing, but beyond that, are there any limits? EDIT: It might help if I signed up: I'll do light gray/dark blue and number 17! Where should we send these to when they're ready? Last edited by Dave-o-rama on Sun Mar 18, 2018 8:23 pm, edited 1 time in total. As you known, I love this idea and i'm glad that someone is with me to work on It. I will prefer to work on 16 cars by my own, i have so much ideas to share with you. And a question, what about MC Rc and Slater Xl? It would be nice to use them. What do you thing about it guys? Dave, can you please explain a little bit more? What exactly do you plan? I would say, all the cars should have the same "athmosphere". Hard to explain. Trixed - as I already pointed out in Discord, I think for this pack we only should use same style of cars (Pemto/Mc RC). I wouldn't put Sater XL in the pack, personally. Last edited by Kiwi on Sun Mar 18, 2018 8:25 pm, edited 1 time in total. So, uh, I was going to make mine extremely bloody and dirty as if it had just gotten into a horrible accident. Either way, I'll do light gray/dark blue and number 17! Where should we send these to when they're ready? This sounds interesting, I would say just try it and maybe post some pics of your progress, then we can discuss together if it fits the pack. When you are done, just send it to me in Discord. I have no problem with it, you can do whatever you like Just wanted to provide a basis, to coordonate work between all the people who wants to contribute. Oh sweet, I was already working on a Pemto repaint so I'll join! I'll use number 99 and a pink/dark blue color scheme with sponser Cloud 9 (not the esports organisation, like the saying). Great Wichilie. I put you in the list. @all: Regarding mapping - do you think you can use the current mapping, or do you need more freedom? EDIT: Awesome job, Dave! This is a very good start. Looks fun. So I feel like joining in the fun, and my car will be in a muted slate & yellow kind. Is it okay to put "tape" over the headlights or is that a criminal offense? You can add this tape thing Mace, sounds interesting. So which starting number your car will have? Kipy have volunteered for the parametering, thx Kipy! How will you do it, any idea? I'm very interested in this, and would love to participate! I have however never done any non-pixel art texturing, so I'm doubting if I would be capable of making something up to the standards. It ended up more purple than pink, but oh well :­P. The mapping does give some limitations (some faces are thrown in a big pile '^^) but it's fine, really. I'll pm you the .bmp Kiwi. Edit: I forgot the orange number was necessary, so the picture above is slightly inaccurate now. Last edited by Wichilie on Tue Mar 20, 2018 3:03 pm, edited 1 time in total. 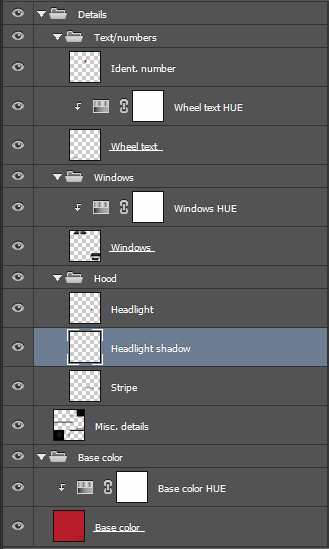 I made a Photoshop file with most of Pemto's details on seperate layers and some hue masks (which won't leave ugly edges on the aliased details), feel free to use it. The stripe on the front is slightly different to the original since I made this from Cloud 9's .psd which has it altered, but you can paste in the original if you want it. I did some adjustments to the project. We will collect as many cars as possible (up to 100). In the end of the project, there will be a community poll which cars should be in the final pack. Every person is allowed to do up to 10 cars. I‘ve also expanded the list to all starting numbers (0-99), to have a better overview. Also the same mapping should be used. If necessary, small adjustments are allowed. But please stick to the Pemto style. Every car should have the same "basis parts" (same front grill, same back lights, and so on). Small adjustments are allowed. Ah, cool. So I could try to create a repaint, and if it's not good enough, it won't be included. Well, in that case it probably won't be included anyway, if there will be actually experienced people making up to 10 cars. My initial purpose was to have a high-quality pack of Pemto-liveries, with Stock-like style. I didn't imagined, that there would be THAT MUCH contribution. So today I decided, to solve it this way (to do a voting in the end). I think it's the easiest and best solution, otherwise people ether yelling that they just was to slow to finish a livery, or yelling that some people are doing to much liveries, or yelling that people with not so good skills doing cars as well. With this new way, everybody have a chance - and in the end it will be a community-decision, which cars will be included. Off-topic, wasn't the Pemto supposed to have a ducktail like the Mc RC? I mean, it was based off the Ford Taurus SHO race car, and the cars shown in Groombridge's website shows early versions of RV cars, yes? My assumption was that the Pemto in the miniature screenshot was the early model (hence the lack of ducktail), and someone remodeled the car just like that. About parametering: I know, the goal for these cars is being balanced. We can reach it via fiddling with top speed, engineratio (acceleration), turning abilities, weight, transmission and suspension. We can cause pretty different feelings of driving with these, such as: a slightly slower car can easily catch up at corners, erasing its disadvantages at straight parts if the faster car has a less good turning behaviour and/or acceleration at the same time. Well, we have to work in team with the volunteers and Shara, who'll balance them, but I hope that cars' characteristics won't fade during balancing process. This looks good! Thx Mace for participating Is this skin finished already? If so, I will mark it as "Finished". You make a good point here. I have no idea if it is this way - I think nobody knows at the moment. But since the car on the screenshot looks like this way (without ducktail), I think it's OK that the Fan-Pemto is looking the same. About parametering: I know, the goal for these cars is being balanced. We can reach it via fiddling with top speed, engineratio (acceleration), turning abilities, weight, transmission and suspension. We can cause pretty different feelings of driving with these, such as: a slightly slower car can easily catch up at corners, erasing its disadvantages at straight parts if the faster car has a less good turning behaviour and/or acceleration at the same time. Well, we have to work in team with the volunteers and Shara, who'll balance them, but I hope that cars' characteristics won't fade during balancing process. I like this approach very much, Kipy. Thx for taking over this part. Please connect yourself with the other parameter-guys, to organise this. A few words regarding amount of parameters: We need 16 pieces of it, because the final package will contain 16 cars. Thx Marco, I have added your cars to the list. But one thing: Can you please change the theme to something else - or do a slightly adjusted name (and logos) for it? We don't want to have "real" brands on the cars. Thank you! Added you to the list, sponsor sounds promising and stock-like. I have added you to the list, Tryxn. Regarding "do it in time", don't worry. There is no deadline so far. If you will send me something till beginning of April, it should be OK.